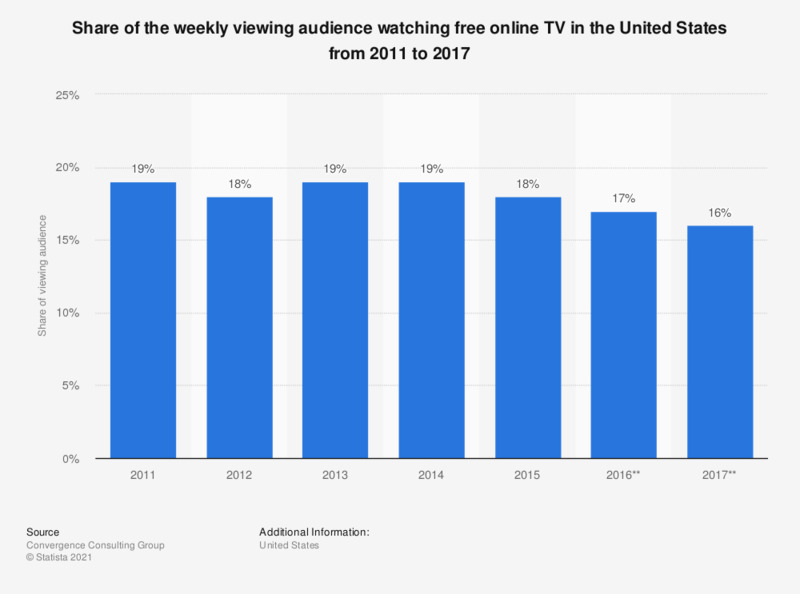 This statistic shows the share of the weekly viewing audience who watched on average up to four free online television episodes a week in the United States from 2011 to 2016, with a forecast thereof for 2017. According to the source, 17 percent of the viewing audience watched free online TV in 2016. Note: The statistic concerns the share of audience members who watched on average one-two (in the 2013 edition of the report) or two-three (in the 2014 edition of the report) or three (in the 2015 edition) or four (in the 2016 and 2017 editions) episodes a week at a broadcaster or cable network or one of their distribution partner's websites (CBS Audience Network & Hulu/partners). Free online TV does not include Hulu Plus, iTunes, Netflix etc or sites requiring a paid subscription. Figures for the period 2011 to 2014 come from previous editions of the report.